The new 2011-12 Idea Book & Catalog has been available for just over a month and the SU Only Challenge Team wants to see your favorite stamp set! Oh I know…how can you possible choose??!! That was my thought when I first saw the challenge! After sitting down and looking at all my new sets, I finally decided on Creative Elements. It was one of my first “must have” stamps when I first looked through the catalog. I love that it has such a variety of images and can be used to create so many different looks. I started knowing that I wanted to try collage stamping. In fact, I was really inspired by this card by Jenna Barber. I had never tried this technique and I was surprised at how easily it came together. I started with Watercolor Paper (it comes in a new larger size – yea!). First I sponged on some River Rock, Cajun Craze and Soft Suede ink creating some different colored sections. Then I stamped on the flourish from Creative Elements in Soft Suede (it was stamped off a bit first). I realized that I wasn’t completely happy with the base coloring so I took my Aquapainter and blended the colors around. The paper was still a little damp when I stamped the frame image (Soft Suede) which allowed it to run at the ends a bit. It needed something else so I pulled out the water spots stamp from French Foliage and added them in River Rock. I used another piece of Watercolor Paper and created a similar background with my Aquapainter. After it dried, I stamped the flower on it and cut it out. I added an Antique Brad to the center and then some new Soft Suede Taffeta Ribbon that uses the pulled thread technique. Finally I layered the stamped image on a square of the new Well Worn DSP. 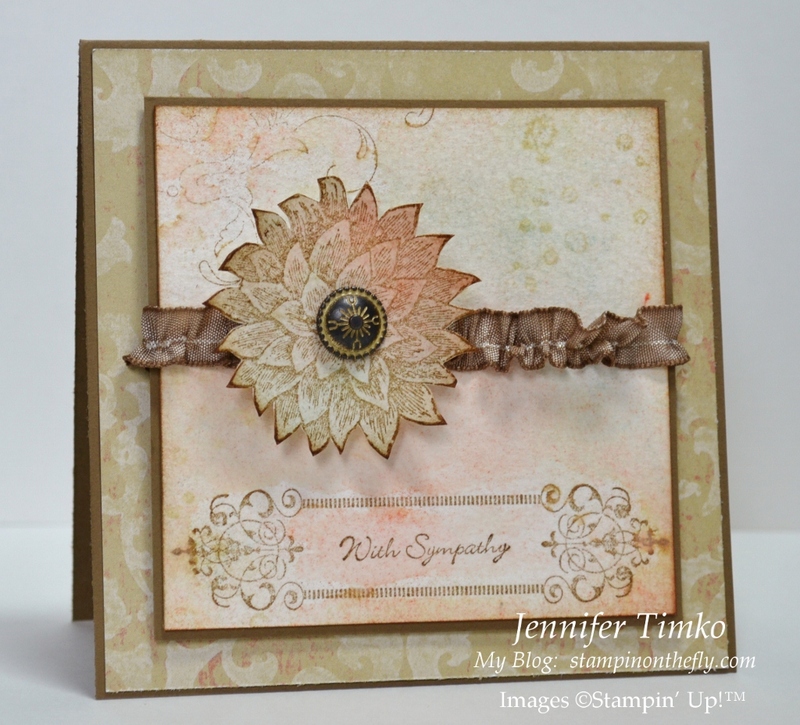 I see so many possibilities with this stamp so you can expect many more cards with it! Shelli Gardner has challenged us to make “Thinking of You” cards this month for those who need a special card to let them know you care. I added the sentiment from Teeny Tiny Wishes and, thankfully, don’t need this right now. I find that when sympathy cards are needed there is sometimes no time to stamp. I try to have a couple of beautiful versions ready just in case. Thanks for stopping in today. I can’t wait to see what you create with YOUR favorite stamp set. Don’t forget, the SU Only Challenge runs for just under two weeks so there is plenty of time to enter! I’ve waited impatiently to know how you made this card! Beautiful! What an absolutely gorgeous card!! I love the colors and the ribbon! This is one of my favorites from this catalog too. Love it! And I love what you did with it here. What a beautiful card! Fantastic background! Beautiful card!! I have never tried that technique before I think I will have to give it a try. This card is beautiful!!!!! 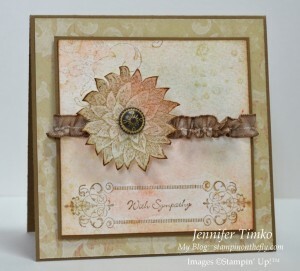 I will be featuring it on My Crafty Picks #29 with a link back to your blog on 8-14-11. Make sure to check it out on Sunday and pick up your blog badge for being featured!! Beautiful and subtle, but complex. Great card! This is very pretty! All the sponging and layering makes such a unique image!